Unlike my recent trip to Barnyard where I successfully made it through the doors of a restaurant within a month of it opening, Duck & Waffle has been on my to-visit list for about 680 days. Located on the 40th floor of the Heron Tower in the City of London, Duck & Waffle made it’s debut to the London restaurant scene in the summer of 2012 (about 680 days ago). 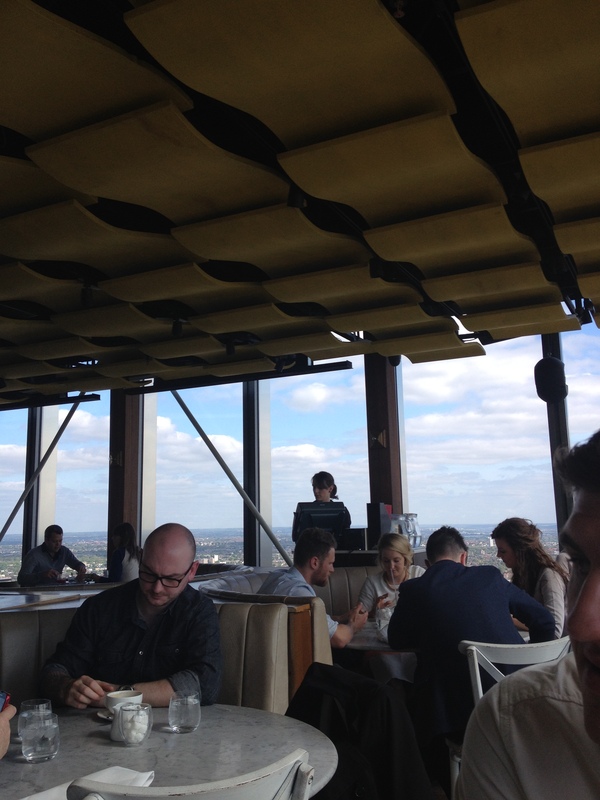 With 24/7 opening hours and magnificent views of the London skyline, Duck & Waffle is undoubtedly on the to-do list of many visitors to the city. 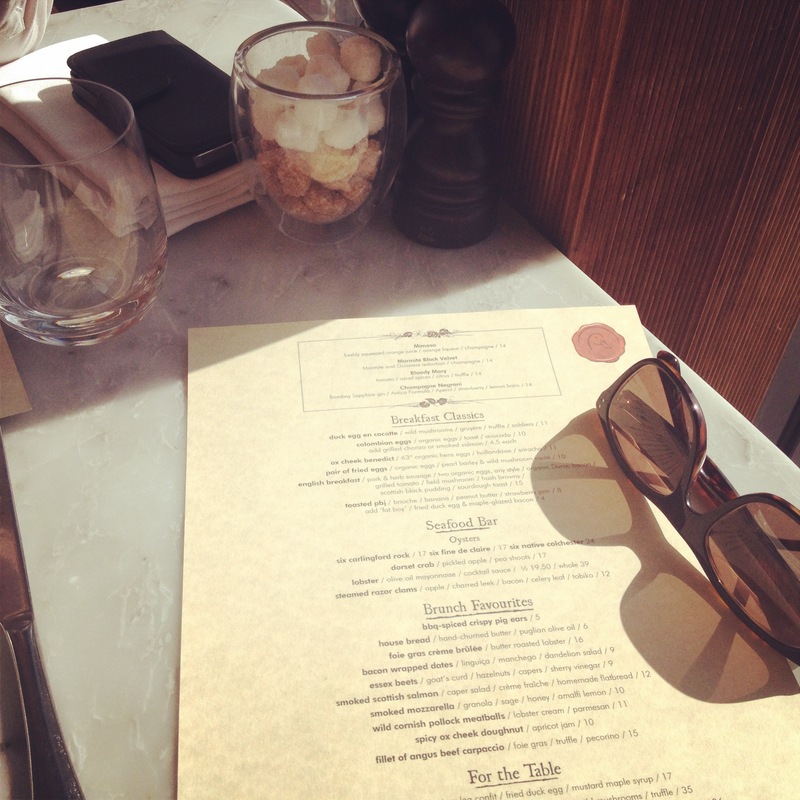 A friend and I were super organised and made an advanced booking for a 10 o’clock Saturday brunch. Drama struck the night before our trip, as my friend was unwell and not fit for fine dining the following morning. At such late notice I didn’t think I’d be able to find a replacement dining partner for my long awaited Duck & Waffle reservation. Luckily a handsome alternative stepped in at last minute and we were on our way! 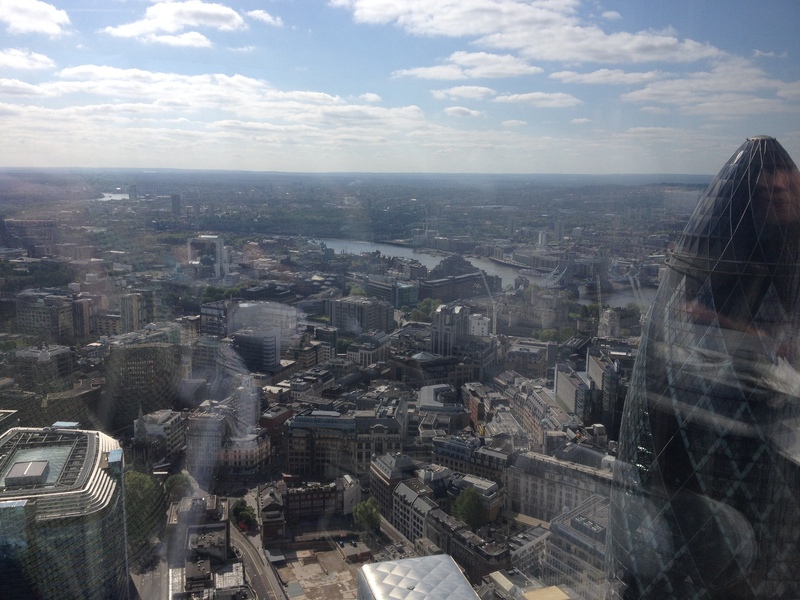 It was a gloriously sunny day in East London and the views from the 40th floor of the Heron Tower were exactly what we needed to kick start the bank holiday weekend! 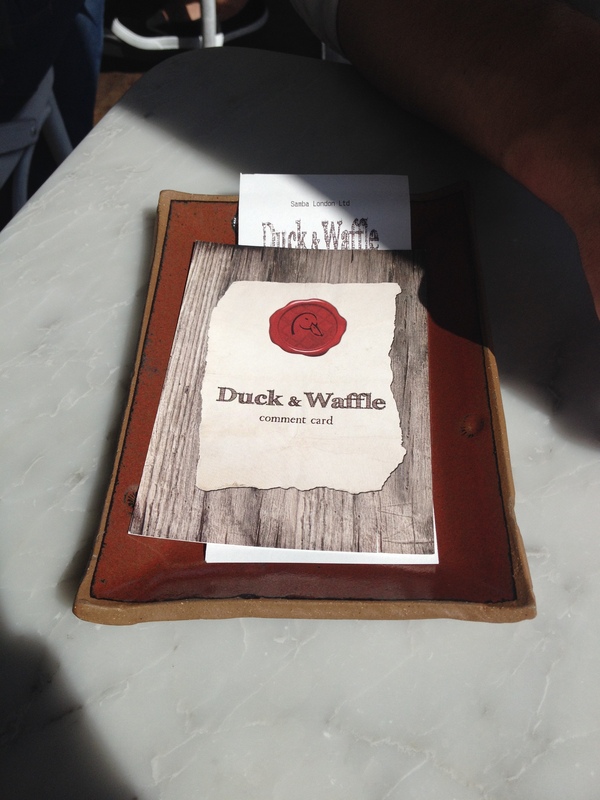 Duck & Waffle’s brunch menu is presented on one sheet of brown paper, representing parchment with the familiar Duck & Waffle wax seal logo at the header.  Divided into sections, Breakfast Classics, Brunch Favourites, the Seafood Bar, dishes ‘For the Table’ and Sweet, the menu covers a choice of British and European inspired classics. 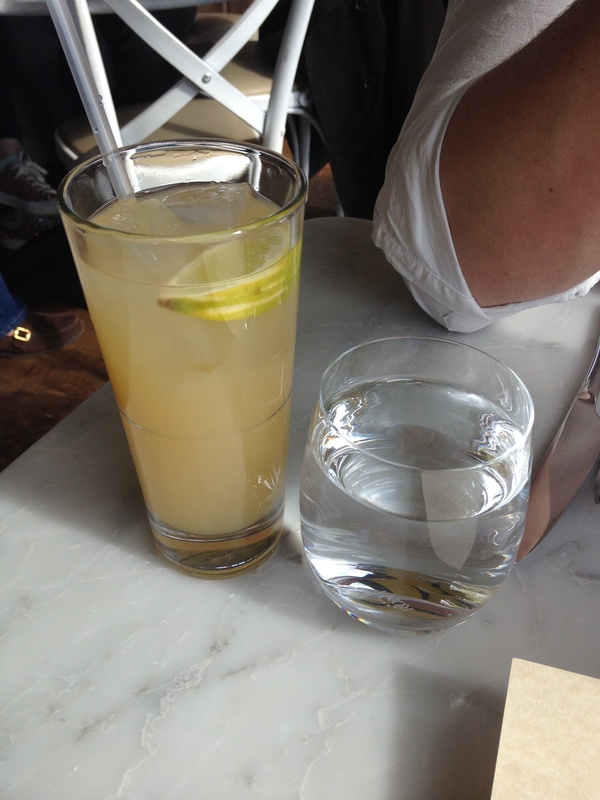 After much deliberation, I decided to order something I wouldn’t usually go for (that’s right, not smoked salmon!). A Toasted PBJ is a classic American dish consisting of peanut butter, jelly (jam) and bananas. 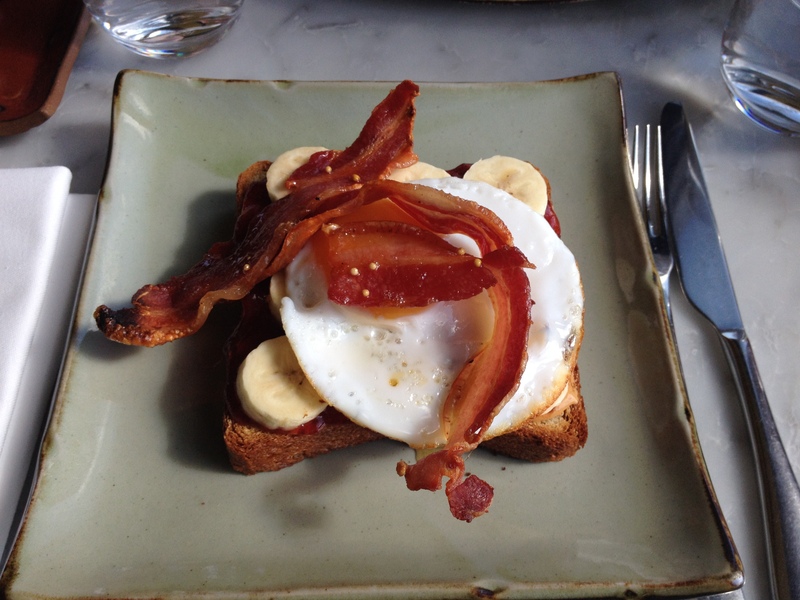 Duck & Waffle’s take consisted of a thick slice of toasted brioche, a layer of neatly sliced bananas, peanut butter and strawberry jam. 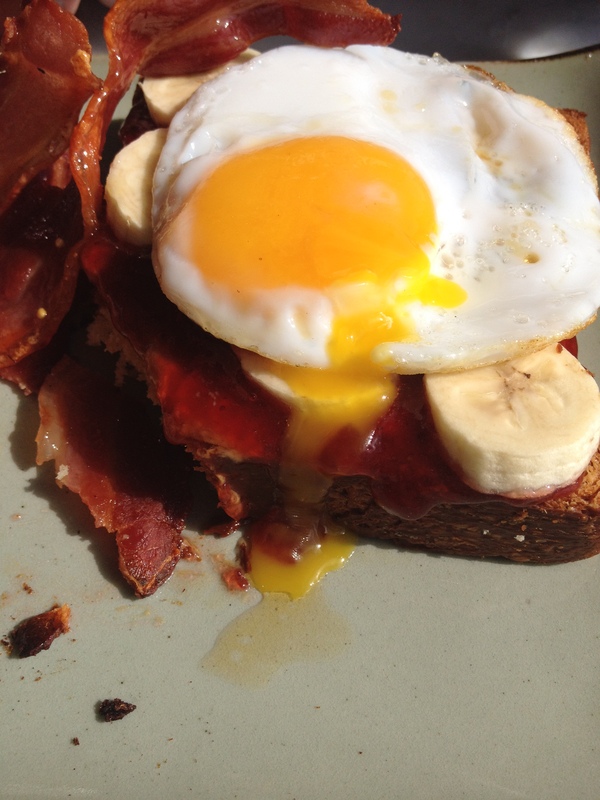 The menu pairs the PBJ with a ‘Fat Boy’ supplement – a fried duck egg with maple-glazed bacon, which I obviously had to go for. As you can imagine, sweet brioche, ripe banana slices, smooth nutty peanut butter and fresh strawberry jam is a very sugary sweet combination. I’m glad I’d opted for the fried duck egg as otherwise it would have been too stodgy. I’d describe it as an ‘alternative’ dish, the ingredients did complimented one another and nothing overpowered anything else. I have to say that the maple-glazed bacon was a bit disappointing. For starters, it was pretty hard to cut using a normal table knife and it was just a bit too hard and chewy. The fried duck egg on the other hand was divine, with a gooey yolk and perfectly cooked white, it was so neat! They must have a fancy egg frying gadget! 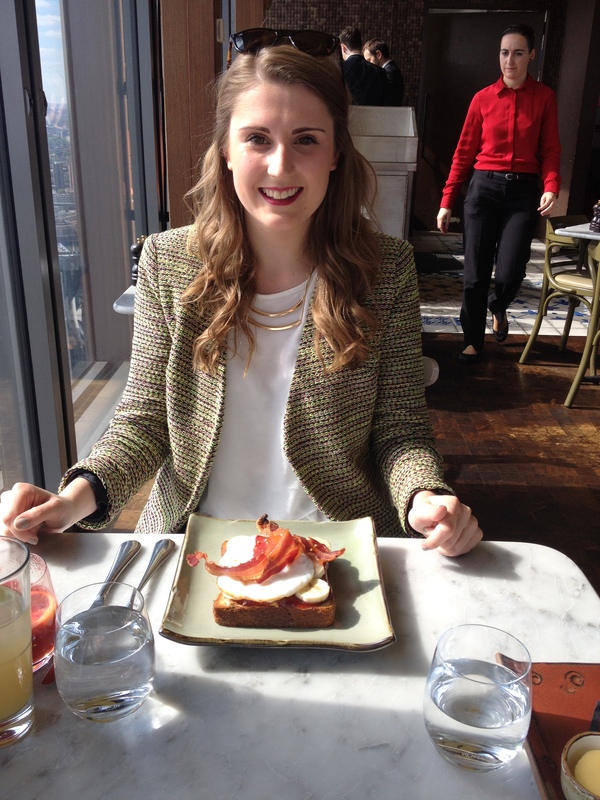 I enjoyed Duck and Waffle’s PBJ but it was so sweet that I couldn’t quite manage the last two mouthfuls. 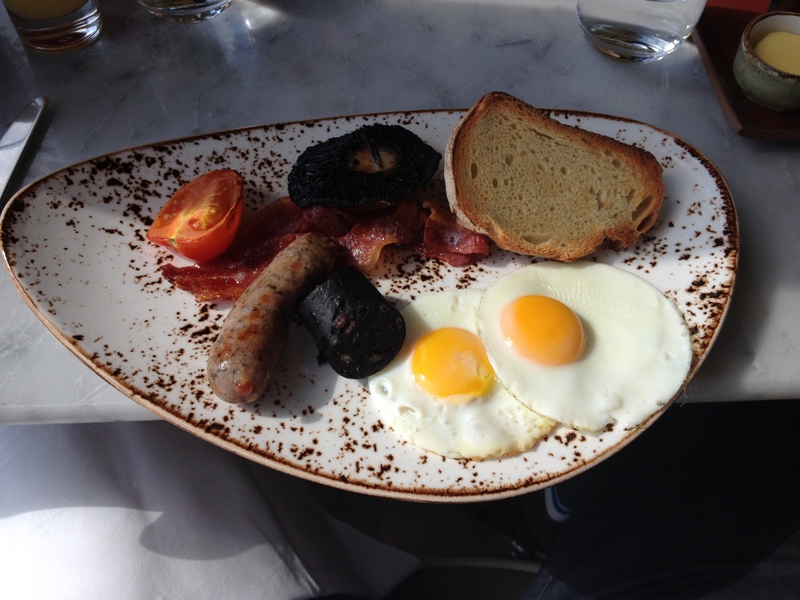 My dining partner went for the English breakfast – pork & herb sausages, two organic eggs, organic Duroc bacon, grilled tomato, field mushroom, hash brown, Scottish black pudding and sourdough toast. Corrrrrr, can’t go wrong with that can ya? Beautifully presented on a large ‘speckled’ plate it looked very appetising. The perfectly fried eggs sat next to a thick slice of black pudding, I tasted some of the spring onion hash brown which were very fancy, deliciously fluffy potato. The dish was devoured and thoroughly enjoyed. 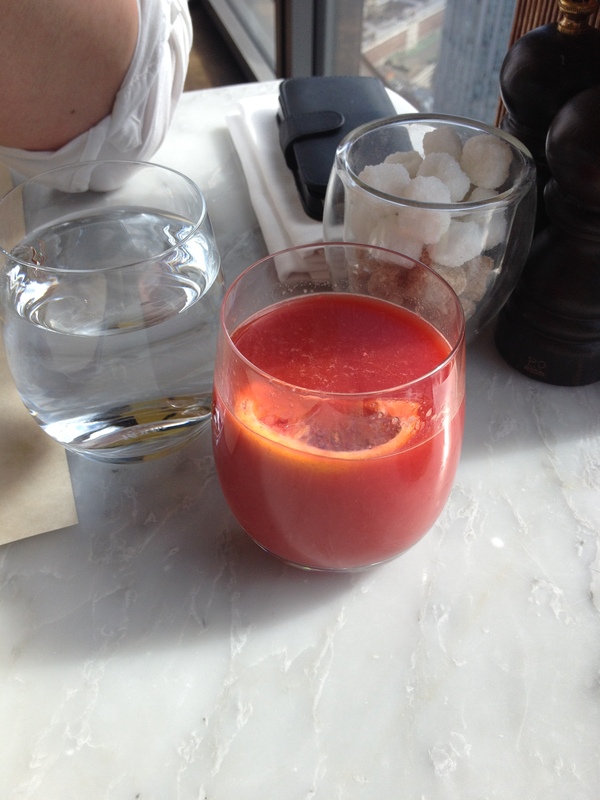 We accompanied our brunch with glasses of fresh fruit juices, I went for Blood Orange and he went for Pressed Apple. 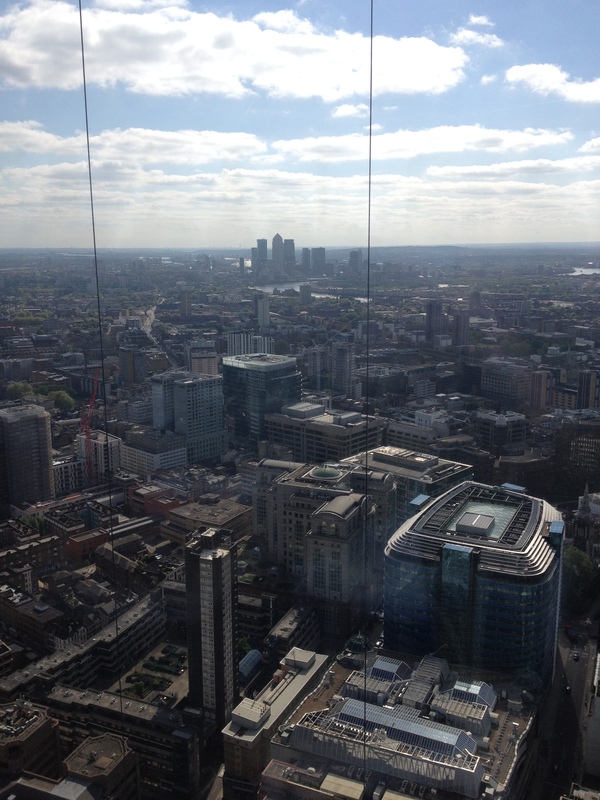 The view from the 40th floor of the Heron Tower is really something, I’d love to go again and enjoy a clear sky-ed evening at Duck & Waffle. 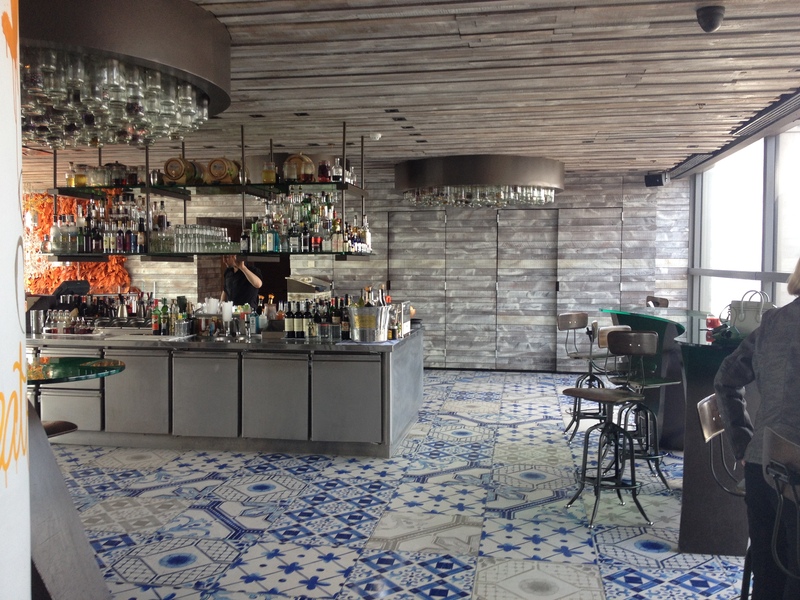 It’s an awesome restaurant, the decor is unique, the atmosphere is happy, the staff are professionals and the menu is exciting. A serious must-visit.